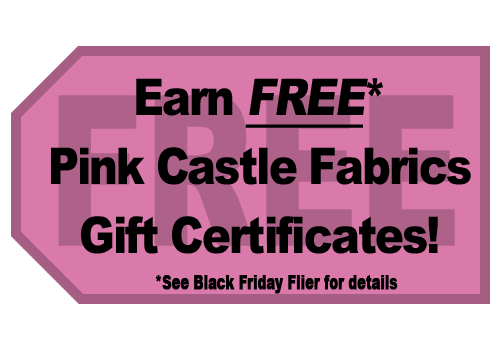 Pink Castle Blog: Holiday Sale! Take 20% off all bundles and precuts with coupon HOLIDAY20 starting now! AND (now until December 2nd) earn $5 for every $50 you spend in one order! You will get your gift certificate(s) in your order! See the flyer for details. Download our Holiday Specials Flyer here. This way you can print it off, circle what you'd like, and leave it out for Santa to see. Don't forget we have Gift Certificates for those hard to shop for fabric lovers, which can be spent on fabric, or on monthly clubs , classes and Camp Stitchalot! But there are many more things than I've mentioned, so take some time to look around!